If your Office 365 Enterprise subscription comes with the enterprise voice capability, your Lync Online user interface will display a phone icon along with the Contacts, Activity Feeds, and Conversations icons. 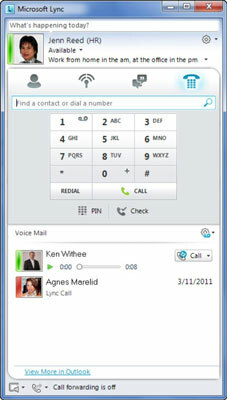 With Lync’s Soft Phone feature, you can make and receive calls within the software. If you have voicemail, the phone icon will display a number to indicate how may voicemails you have. Within this feature, you can easily see who called and listen to the message they left. And because messages are stored in the Office 365 Exchange Online service, you can view the same message in Outlook and read the transcription of that message. Lync wouldn’t be Lync if it didn’t give you options. With that in mind, you can easily switch from any devices hooked up to your computer with one click. Not only that, but you can check the audio device settings and even check call quality from within this little icon on the bottom-left corner of the Lync user interface. The rich telephony capability lets you switch the call to your cellphone or desk phone, forward your calls, set the ringer to ring both on your desk phone and on your computer, and a whole lot more!